The BJP on Tuesday announced that it is joining hands with the ruling All India Anna Dravida Munnetra Kazhagam (AIADMK) in Tamil Nadu for the upcoming Lok Sabha elections. According to the agreement reached today, BJP has been allocated five seats. For the bypolls in 21 seats, BJP will support the AIADMK candidates. "Extremely delighted that AIADMK and BJP have concluded a very fruitful discussion for the Parliamentary elections and the 21 byelections," Union Minister Piyush Goyal said. 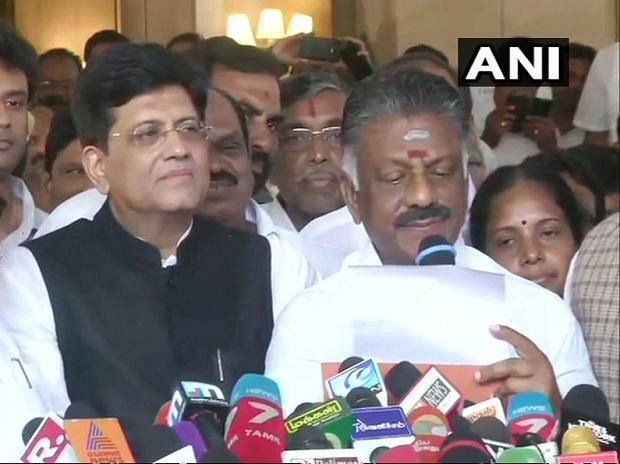 Although the announcement was made on a full moon day -- which is considered auspicious for new beginnings -- the decision for the alliance was taken last Thursday when Railways & Coal Minister Piyush Goyal visited Chennai and met Tamil Nadu Chief Minister Edappadi Palaniswami and Deputy Chief Minister O Paneerselvam. Both the parties are expected to bring Pattali Makkal Katchi (PMK) and Vijayakanth's Desiya Murpokku Dravida Kazhagam (DMDK) into their fold. The upcoming polls are crucial for the leadership of both the ruling and opposition Dravidian parties -- AIADMK and DMK -- as they would go to the battlefield under new leadership. Since the death of its supremo J Jayalalithaa, AIADMK has suffered infighting and factionalism, while also losing Jayalaithaa's constituency RK Nagar to rebel leader and Jayalalithaa's close aide V K Sasikala's nephew TTV Dhinakaran in a byelection. For DMK this will be its first major election under Stalin's leadership who has been appointed party chief after the death of its supremo M Karunanidhi last year. With the Lok Sabha polls just around the corner, the BJP is planning to ally with regional parties in order to boost its chances of retaining power. On Monday, the BJP also set aside differences with the Shiv Sena and joined hands with them for not just the upcoming Lok Sabha polls, but also the state elections later this year. Political experts say the decision to join hands with the AIADMK could provide the BJP with a chance to challenge their national rivals Congress, who have already formed an alliance with AIADMK's premier rival DMK. However, opinion polls suggest that Congress and DMK alliance will dominate Tamil Nadu in the upcoming polls. In the 2014 elections, the AIADMK won 37 of the 39 seats, while the BJP and Pattali Makkal Katchi won a seat each. AIADMK was the third largest party in the Lok Sabha, after BJP and Congress, during the period and this had made it an important player in the national politics in some instances. In the 2014 polls, the BJP had contested elections in an agreement with MDMK, PMK, DMDK, IJK, KMDK and PNK. While BJP and MDMK had contested 7 seats each, the DMDK had fielded candidates on 14 seats. The PMK had got 8 seats and the rest contested on one seat each.